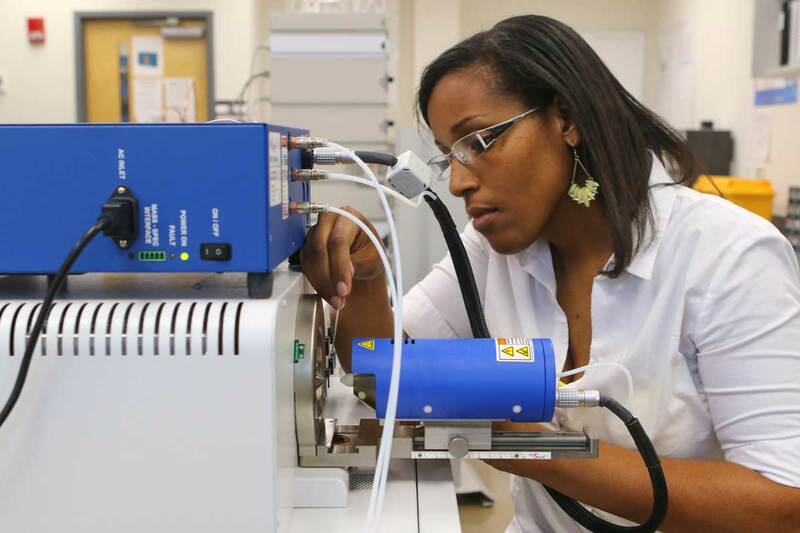 Forensic scientist Candice Bridge ’07PhD is leading a team in the development of a database detailing the chemical makeup of common condoms and lubricants on the market to supplement evidence. Researchers from the University of Central Florida are a step closer to giving law enforcement officials a new tool to help track down rapists and other sexual offenders. Forensic scientist Candice Bridge ’07PhD has spent the past two years leading a team in the development of a database detailing the chemical makeup of common condoms and lubricants on the market. The idea is to fill in the gaps when DNA evidence is unavailable from a crime scene, and to supplement other pieces of evidence in sexual assault cases. The National Institute of Justice just awarded Bridge another $354,000 to continue her work, which could lead to a national model. For example, if a specific lubricant is used during an assault and samples are recovered and then found in a suspect’s home with his or her fingerprints on it, a connection could be made between the suspect and the victim. Alone, it might not result in a conviction, but it would be another piece of evidence to build a prosecutor’s case. Bridge and her team know the database is solid because they have built and tested it at the National Center for Forensic Science at UCF. Now researchers will focus on creating a standard analytical protocol so their work can be replicated in crime labs worldwide. Part of the challenge lies in the wide variety of lubricants and condoms available. Their research to date has developed different categories like silicone-based lubricants versus water-based. They’ve also differentiated traits among condoms like flavors, warming agents and anesthetics. The other difficulty lies in the degradation of source material. Consulting with local law enforcement agencies like Orlando and Kissimmee police departments revealed that often sexual assaults are reported days after they occurred. Traces of lubricants can still be present, but the chemical makeup has changed after long-term interaction with the body’s bacteria. Research will eventually be able to indicate the age of the lubricant. “We want to address some of the real-world issues investigators encounter,” Bridge says. After her initial research went public in 2016, several victims reached out to her, she says. She heard stories from victims whose cases were dropped for a lack of evidence, and she received notes of gratitude for pursuing this line of research. Scientists try to divorce their emotions from their research to avoid unintentional implicit bias, and it’s usually not hard in the sterile laboratory environment, Bridge says. But getting those phone calls and email confirmed to her that science can have an impact and change lives. Bridge’s research background includes five years as a forensic chemist and research physical scientist with the U.S. Army’s Defense Forensic Science Center. She received her doctorate in chemistry from UCF in 2007, and has been teaching at UCF since 2014.